The original manor rooms, modernised. Staying in an Irish castle is a fairytale experience from the moment you pass beneath the magnificent gates on the edge of our 40-acre estate. Every detail from the full suite of armour that welcomes you in reception, to the elegant furniture that awaits you in your room, has been restored, remastered or reimagined to give you an real sense of what it was like to live in the original rooms of this magnificent home at the height of its splendour. While the unique look and feel of our authentic castle rooms is of the old-world, the finish and touches of finesse are anything but. So sit back, relax and enjoy your time with us surrounded by the best of modern comforts including temperature-controlled air-conditioning, in-room electronic safe, HD television and even under-floor heating in your beautiful en-suite bathroom. The Turlough O’Carolan Suite from TullyFilms on Vimeo. The King Tenison Suite from TullyFilms on Vimeo. The Lough Meelagh Suite from TullyFilms on Vimeo. The Kingston Castle Suite from TullyFilms on Vimeo. 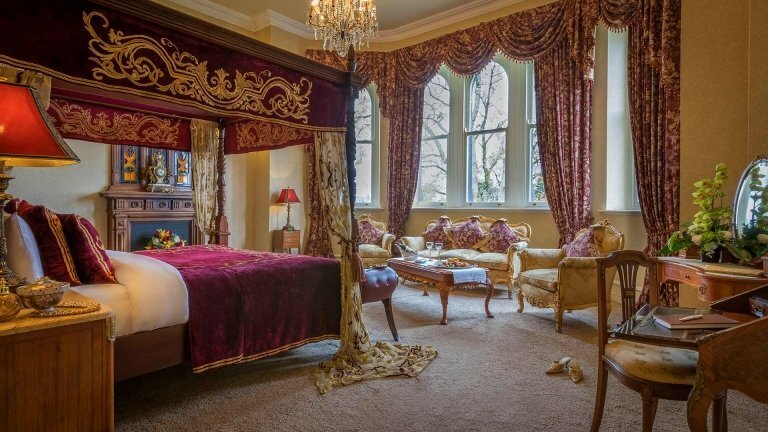 Named in honour of the legendary blind harpist and composer affectionately remembered as the last of the Irish bards whose body lies in Kilronan Cemetery, the luxurious Turlough O’Carolan Suite is one of the most popular rooms in Kilronan Castle Estate & Spa. Beautifully decorated to reflect its historic essence, it features an imposing four-poster bed surrounded by beautiful period furniture. The large en-suite bathroom includes under-floor heating, his and hers sinks and a double Jacuzzi overlooking Lough Meelagh. Spacious, comfortable and equipped with Nespresso™ coffee machine, complimentary water, bathrobes and slippers, award-winning Elemis amenities, flat screen televisions and in-room air conditioning, this is the perfect place for a romantic getaway. When sold to Richard Tenison in 1715, Kilronan Castle became known as Tenison Castle. We now honour this great history with a magnificent suite fit for royalty. Elegantly decorated in shades of gold and duck-egg blue, this beautiful room includes a magnificent hand-crafted mahogany four-poster surrounded by a host of antique furniture from which to sit back and relax in your luxurious room. While the large en-suite bathroom includes a stunning double shower, your room is spacious, comfortable and equipped with Nespresso™ coffee machine, complimentary water, bathrobes and slippers, award-winning Elemis amenities, flat screen televisions and in-room air conditioning, making this is the perfect space to spoil yourself. Named in honour of the daughter of the Earl of Kingston who married into the Tennison family, this stunning top-floor suite provides awe-inspiring views of the estate. While the beautiful bedroom contains a magnificent four-poster bed, the large en-suite bathroom includes under-floor heating, a marble freestanding bathtub and even his and hers sinks. Spacious, comfortable and equipped with Nespresso™ coffee machine, complimentary water, bathrobes and slippers, award-winning Elemis amenities, flat screen televisions and in-room air conditioning, this is an ideal place for indulgence. This very special room is a celebration of the beautiful lough upon whose banks our magnificent castle is built. Spacious and bright, this suite has high ceilings and tall windows allowing you to take in the unrivalled views of Lough Meelagh, the surrounding grounds and its seemingly never-ending woodlands. Experience unimaginable luxury as you enjoy your magnificent four-poster bed, large en-suite bathroom includes with under-floor heating, a cast-iron freestanding bathtub and even his and hers sinks. Spacious, comfortable and equipped with Nespresso™ coffee machine, complimentary water, bathrobes and slippers, award-winning Elemis amenities, flat screen televisions and in-room air conditioning, this is a room with a view both outside and in.